President Vladimir Putin's initiatives to improve Russia's position in the World Bank and International Finance Corporation's “Doing Business” ratings appear to have worked. In the latest study, “Doing Business 2013: Smarter Regulations for Small and Medium-Size Enterprises,” Moscow improved its ranking by eight positions for 2012, finishing in 112th place. The World Bank assessed the progress of 185 countries in terms of facilitating business. For Moscow, the results were the best they have ever been. Russia's position in the rankings (the country is classified as a “major business center”) was eight places higher than last year. It is worth noting that the past year has seen Russia double the rate at which it is climbing up the rankings: in 2010-11, it managed to rise from 124th to 120th place out of 183 countries; this year, Russia finds itself in 112th place, sandwiched between the island nation of Palau (above) and the Republic of El Salvador (below). In the 2012 run up to June, Russia implemented two reforms that improved the business environment. Both were responsible for hoisting the country up the rankings: the abolition of multiple pre-construction procedures made construction easier in Russia, in the same way that paying taxes was made easier by a simplified VAT procedure and the introduction of electronic services. The World Bank and the International Finance Corporation use ten equally weighted indicators to measure the ease of doing business. Progress in each of these areas determines a country's overall place in the rankings. Compared with the previous report, Russia improved four indicators, while six, including protection of investors, deteriorated slightly. Augusto Lopez-Carlos, director of global indicators and analysis at the World Bank, said that Moscow's current position was mainly determined by its “significant improvement” in tax payments and, to a lesser degree, progress in the judicial system and business registration procedures. It should be mentioned that Russia's surge in tax administration indicators was foreseen by Finance Minister Anton Siluanov. The zeal with which officials have begun to champion Russia's position in the rankings is understandable: A May 2012 decree to that effect was issued by President Vladimir Putin. In regards to long-term economic policy, one of his instructions to the government was “to take steps to significantly improve the ease of doing business.” Putin estimated that this was due to be reflected in the country's DB ranking: from a modest 120th place in DB 2012, to a target 50th in DB 2015 and 20th in DB 2018. The indicators used by Russia's DB analysts also form the basis of a series of road maps developed with the government’s approval by the Agency for Strategic Initiatives (ASI), in order to improve the country's investment climate. The progress made in reaching the goals outlined in the road maps will also have some bearing on the performance assessment of officials. According to the ASI, of the 16 road maps due to be framed in 2012, eight are currently ready. Of these, only four were approved last summer by the government. 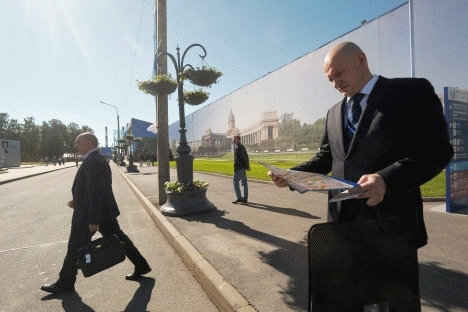 Under the road map to facilitate the issuance of construction permits, Russia is looking to move from its current 178th to 86th place by 2013; and under the road map to enhance network connectivity, from 184th to 130th. But, as noted by the World Bank, a country's rate of progress in the ranking does not always determine the quality of its business environment. “Changing the rules is pretty simple. It's much harder to implement the changes,” said Lopez-Carlos.